When comparing these two Rachmaninoff works side by side one is aware of how far the composer had come in advancing his skills. The Rock was composed after he had graduated in 1892, fourteen years before his Second Symphony. It is interesting to see how far the composer had advanced over a period of 14 years. The Rock started life as a piece inspired by a short story of Chekhov, Na puti. It tends to mask its obvious freshness by an absence of the rich orchestral textures that Rachmaninoff became known for in his now famous symphony. 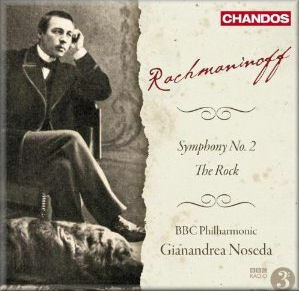 Written when Rachmaninoff was 20, The Rock is clearly the work of a young composer setting out to gain his confidence, yet there are corners of charm that makes the piece respectable in its own right. Symphony No. 2 is one of Rachmaninoff’s finest compositions where his latent talents surface. Following an obvious disappointment in his unsuccessful 1st Symphony, it displays a marked confidence in the ascendant and indicates the composer’s strengths at the zenith of his career. Strong, passionate and memorable melodies run through the work. The broad sweep of rich harmony over its broad canvas have made the work a favourite in the concert hall ever since. Symphony No. 2 has many recordings to its name and one wonders what fresh aspects this BBC Philharmonic recording can bring to the public with yet another performance. This performance reinstates a number of cuts that the composer made after its first performance and so it is interesting to hear the originally intended construction. I notice a few places where if my memory serves me correctly there are different phrases and chords and these can provide a refreshing change. In the third movement there has been a long cut after 4:00 in since here a fresh section begins. I do not find its inclusion lifts the work and have to consider that Rachmaninoff probably cut it for good reason. I leave the listener to judge whether they think this was a good thing or not. The flow of the revised score is probably tighter and helps the development. A certain strength in this recording lies in its leader, Yuri Torchinsky, who will be very much at home with this Russian composer. It also does not go unnoticed that Italian conductor, Gianandrea Noseda, studied under Valery Gergiev (of Mariinsky fame) and will have also studied Rachmaninoff in his training. The orchestra provides an excellent reading of the score. The Rock as a work I can take or leave and despite its good playing it does not enthuse. It is the vibrant glories of the Second that for me are cherished. We are told that the Second Symphony was sketched in a charming garden villa in Dresden, Germany. Despite this, the effects of Rachmaninoff’s often depressive state looms in the 1st movement (largo). The self-critical composer laboured considerably over his 1st movement. Then he worked more speedily and profitably over the later and clearly inspired movements that carry a momentum to which the orchestra responds. The flamboyant fireworks of the 4th movement (Allegro vivace) are spectacular. Elsewhere the tempi, warm horns, bright string playing and rich acoustic combine to establish a magical wonderment that tingles the senses. The booklet presents notes in English, German and French.